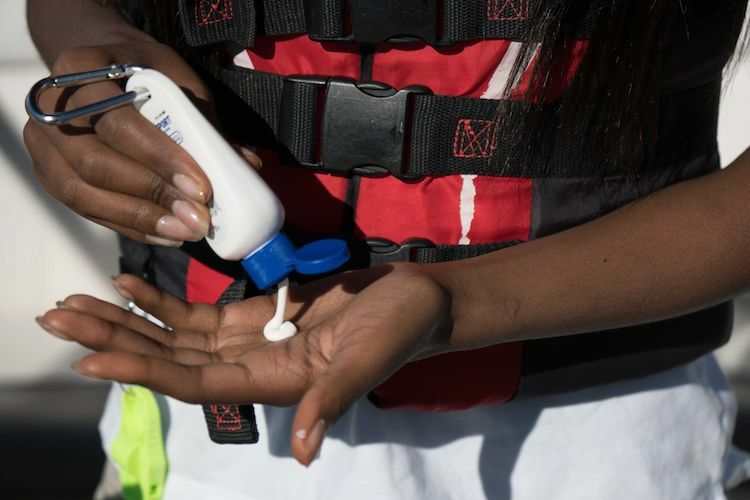 Sun safety is an often overlooked aspect of boat safety. With fishing, cruising, tubing, anchoring, lounging, and entertaining, the time spent on a boat adds up quickly. And according to the Center for Disease Control (CDC), if not properly protected, the sun’s ultraviolet (UV) rays can damage a person’s skin in as little as 15 minutes. 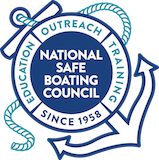 Based on a 2012 U.S. Coast Guard survey report, the average boater spends 5.7 hours on the water per outing. Prime boating times between 10 a.m. to 4 p.m. typically correspond with peak UV exposure times. 8% of boaters enjoy SUNBATHING as part of their recreational boating activities. UV rays can reflect from the water and fiberglass boats and damage skin – even on cloudy days! Sun safe boating involves an integrated approach to sun protection to avoid overexposure to UV radiation. Do not sunburn: Sunburns significantly increase one’s lifetime risk of developing skin cancer, especially for children. Apply sunscreen: Generously apply sunscreen with SPF of at least 15 with UVA and UVB protection. Apply about one ounce to cover all exposed skin 20 minutes before going outside. Reapply every two hours, even on cloudy days, and after swimming or sweating. Wear protective clothing: Wear protective clothing, such as a long-sleeved shirt, pants, a wide brimmed hat, and sunglasses, when possible. Seek shade: Seek shade when possible and remember that the sun’s UV rays are strongest between 10 a.m. and 4 p.m.
Use caution near water: Water and sand reflects the damaging rays of the sun, which can increase chances of sunburn. Be extra cautious boating at higher altitudes: According to the EPA, it is easy to get sunburned at higher altitudes, because there is less of the earth’s atmosphere to block the sunlight. UV exposure increases about 4% for every 1000 ft. gain in elevation. Check UV Index: The UV Index provides important information to help plan outdoor activities in ways that prevent sun overexposure. The UV Index forecast is issued daily by the National Weather Service and EPA. While some exposure to sunlight can be enjoyable, too much can be dangerous. Overexposure to ultraviolet (UV) radiation from the sun can result in a painful sunburn. It can also lead to more serious health problems, including skin cancer, premature aging of the skin, cataracts and other eye damage, and immune system suppression. And children are particularly at risk. Most people are not aware that skin cancer, while largely preventable, is the most common form of cancer in the United States. According to the CDC more than 3.5 million new cases of skin cancer are diagnosed annually.